As we unravel that which is repressed and stuck in our body-mind, what are the practical tools to help us be with what arises and liberate us from suffering to Self-Realization? What is the path to ‘awakening’ really all about? In Yin Yoga we learn practical mindfulness tools to meet ourselves at the edge of our comfort zone. We learn to transmute unconscious reactive patterns into a vaster field of Open Awareness. Training up the tools to meet the internal and external challenges in our lives as gateways for transformation and awakening. Discover the potential to unwind embodied trauma and transmute suffering into transformation. In this workshop you will learn highly effective tradtional & contemporary, evidence based mindfulness and embodiment techniques, including Embodied Movement, Dynamic & Seated Meditations, Yin Yoga, Yoga Nidra and potent self inquiry & relational awareness practices. Both Mindfulness and Embodiment are becoming vastly recognized worldwide, as a highly effective & life changing tools for stress reduction, pain management, enhanced clarity and well-being, ultimately awakening to our essential true nature. We will explore powerful tools to meet life’s challenges, on & off the mat, learn how to directly and authentically be with what arises, in an infinitely beneficial way. Women, we are not meant to suffer every month! Our menstrual cycle is an organic & potent, stress-sensitive feedback system. Which if understood & consciously nurtured, fosters a natural, highly charged state of heightened intuition, insight, psychic skill & creativity. Discover how to turn pain & suffering into transformation. Reconnect with the inherent power of menstruation & menopause as a woman's innately embodied spiritual practice. In this Yoga Alliance verified 200hr Yin Yoga teacher training, you will learn how to work directly with the 12 main energy meridians of Traditional Chinese Medicine, that conduct chi flow through connective tissue into the 12 main organ systems of the body, within Yin Yoga asana. When coupled with the powerful tools of mindfulness, we learn to optimize organ and tissue health, support mental and emotional balance, and cultivate both self-realization and embodied integration on & off the mat. Learn a profound & practical pathway for potentialising liberation within yourself, while cultivating the direct tools to support and guide others towards their highest potential. Join Dee Kennedy & i for an experience of a lifetime in Egypt!! Exploring the Ancient Mysteries in real time! Are you feeling the call? ‘Awakening the Divine’ Egypt Temple Tour, journeys the initiatory path of the ancient Alchemists, Priests, Priestesses and Pharaohs, while basking in the splendor of Egyptian vista’s, magnificent history, architectural mastery, accessing the mysteries via deep guided Shamanic meditations within the Egyptian Temples. Daily gentle yin yoga practice with Tina Nance, daily discourses on symbolism and the Neteru, discover the chakra system of the temples/pyramids and how they relate to your own body, enjoying the delicious food, heartwarming people, sailing and sleeping on the historic Nile river… This is the trip of a lifetime you have been waiting for! Dee has studied the High Priestess Lineages for over 18years & has 11 years experience in Egypt directly. Come join us for this life changing/ conscious expanding and super fun temple journey through the Ancient Mysteries!. Women we are not meant to suffer every month! 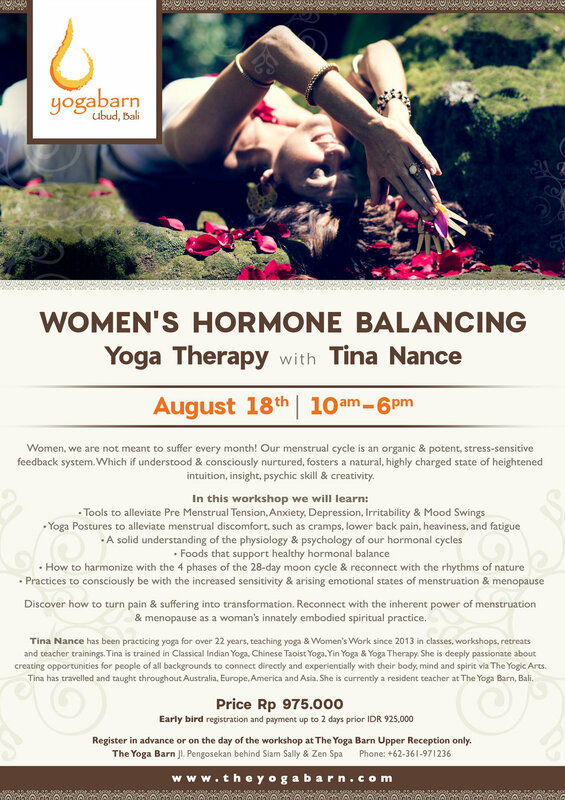 Join us for a 2day holistic immersion designed to nourish & rebalance the female hormonal system with yoga therapy, nutritional support, yin yoga ,creative arts therapy & empowering education. Aiming to equip women with the self-knowledge & practical tools to better understand their cycles & meet a woman's challenges from menstruation to menopause & beyond. Reversing symptoms of menstrual imbalance, including PMS, Menstrual Discomfort & Irregularities, Anxiety, Depression, Mood Swings, Weight Gain, Skin Problems, PCOS, Endometriosis etc. And addressing a whole range of women's hormonal health conditions, from menstruation through to fertility & birth, loss & transition, & menopause. Learn how to turn pain & suffering into transformation & restore balance & harmony within our modern busy lifestyles. In this 100-hour Yin Yoga Teacher Training , we draw from the wisdom of traditional Hatha Yoga, Traditional Chinese Medicine & Taoist Five Element Meridian Theory, and the Mindfulness Meditation practices of Tibetan Buddhism. Women we are not meant to suffer every month! Our menstrual cycle is an organic & potent, stress sensitive feedback system. Which if understood & consciously nurtured, fosters a natural, highly charged state of heightened intuition, insight, psychic skill & creativity. Tools to alleviate Pre Menstrual Tension, Anxiety, Depression, Irritability & Mood Swings. Yoga Postures to alleviate menstrual discomfort, such as cramps, lower back pain, heaviness & fatigue. A solid understanding of the physiology & psychology of our hormonal cycles. Foods, herbs & supplements that support healthy hormonal balance. How to harmonise with the 4 phases of a 28 day moon cycle & reconnect with the rhythms of nature. Practices to consciously be with the increased sensitivity & arising emotional states of menstruation & menopause. Discover how to turn pain & suffering into transformation & reconnect with the inherent power of menstruation & menopause as a woman’s innately embodied spiritual practice. A Deep Immersion into the Mindfulness Awareness Practices of Yoga & Tibetan Buddhism. Exploring traditional & contemporary evidence based mindfulness techniques. including both Dynamic & Seated Meditations, Yin & Yang Yoga Asana, Yoga Nidra, Buddhist Psychology and potent Self Inquiry & Relational Awareness Practices. We will explore powerful tools to meet life's challenges, on & off the mat, & learn how to directly & authentically be with what arises, in an infinitely beneficial way. Mindfulness is becoming vastly recognized worldwide, as a highly effective & life changing tool for stress reduction, pain management, enhanced clarity & well-being, & ultimately awakening to our essential true nature. Increasingly widely practiced in a vast range of environments, from yoga & meditation studios, to schools, prisons, hospitals & the broader corporate structure. Discover the potential to transmute suffering into transformation. Learning practical & effective tools to open in the face of pain & challenge, accessing a gateway to embody the freedom & truth of who we truly are. Whilst learning directly & experientially how to guide & support our students to do the same. Mindfulness is becoming vastly recognized worldwide, as a highly effective & life changing tool for stress reduction, pain management, enhanced clarity & well-being, & ultimately awakening to our essential true nature. Discover the potential to transmute suffering into transformation. Learning practical & effective tools to open in physical & psycho-emotional challenge, as a gateway to accessing & embodying the freedom & truth of who we truly are. What is the yogic path to ‘awakening’ really all about? In this workshop we discover that our Body is the Barometer of our Soul. On the yoga mat, we are unraveling all that has been repressed and stuck in our body-minds, unwinding physical, mental & emotional contractions from the past. Realigning with the potent jewel of the present, within which lives our essential nature. Learn how your body, mind & spirit are connected via a myriad of energy pathways & centres. Discover how to work with this energy body directly on the mat. Learn practical tools of working with Breath, Embodied Listening & Mindfulness within asana, as gateways for Transformation and Awakening. Rediscover the Purpose & Science of Yoga as a pathway from suffering to Self Realization, Transformation & the Integration of the Body, Mind & Spirit. April 12th 10am -5pm, The Yoga Barn, Ubud, Bali. -Tools to alleviate Pre Menstrual Tension, Anxiety, Depression, Irritability & Mood Swings. -Yoga Postures to alleviate menstrual discomfort, such as cramps, lower backpain, heaviness & fatigue. -A solid understanding of the physiology & psychology of our hormonal cycles. -Foods, herbs & supplements that support healthy hormonal balance. -How to harmonize with the 4 phases of a 28 day moon cycle & reconnect with the rhythms of nature. emotional states of menstruation & menopause. -Discover how to turn pain & suffering into transformation & reconnect with the inherent power of menstruation & menopause as a woman’s innately embodied spiritual practice. Are you stressed? Run down? Overworked? Exhausted? -Learn nourishing practices to re-boost exhausted, burnt out bodies & minds. -Healing Yoga Therapy for Relaxation , Revitalization, Tonifying the Nervous System & Restoring our Vital Life Force. -Discover Asana’s, Pranayama’s & Food as Medicine to release embodied stress, fear & nervous tension, to calm & nourish the nervous system & restore deep reserves of vital energy, revitalizing the whole system. Here we learn to slow down & turn within. Consciously reversing the stress response, releasing embodied anxiety, calming & rejuvenating the body & the mind. We bring light to the unhealthy habits & patterns that are draining our life force & learn to deepen our trust in the flow of life & in the innate wisdom within ourselves. In this workshop we will learn: Tools to alleviate Pre Menstrual Tension, Anxiety, Depression, Irritability & Mood Swings. Asana’s ( Yin & Yang ) for Chest Opening, Upper Body Strengthening & Heart Activation. Food as Medicine – Learn how to nourish the heart, encourage healthy circulation, boost your immunity & understand the energetics of “fire” type foods from a macrobiotic perspective. In Fire Yoga we activate the heart centre & clear the way to connect with our heart’s innate wisdom, boundless joy, creativity & unconditional love. Releasing old stuck emotional wounds & protective armouring, we expand our capacity for forgiveness, healthy communication, intimacy & bliss, & learn tools to embody the truth of the love that we are. Food as Medicine – Learn to clean the body with Detoxifying foods & Liver Cleanses & understand the energetics of cleansing & nourishing the liver from a macrobiotic perspective. Learn nourishing practices to reboost exhausted, burnt out bodies & minds. Healing Yoga Therapy for Relaxation , Revitalisation, Tonifying the Nervous System & Restoring our Vital LifeForce. Discover Asana’s, Pranayama’s & Food as Medicine to release embodied stress, fear & nervous tension., to calm & nourish the nervous system & restore deep reserves of vital energy, revitalizing the whole system. In Water Yoga we learn to slow down & turn within. Consciously reversing the stress response, releasing embodied anxiety, calming & rejuvenating the body & the mind. We bring light to the unhealthy habits & patterns that are draining our life force & learn to deepen our trust in the flow of life & in the innate wisdom within ourselves. In Earth Yoga we learn to connect to our organic wholeness & contentment, innate at our very core. Releasing old habits such as unhealthy eating & relationship patterns, that insatiably attempt to fill our mis-perceived emptiness & neediness. And learning to deeply nourish our souls & reconnect to the natural fullness of our grounded centre. Asana’s ( Yang & Yin ) to ground your energy, improve digestion, strengthen your core & stabilize your connection to the earth, within & without. Pranayama & Mantra to nourish your core. Learn practices to heal your relationship with food & reconnect to a sense of fullness & wholeness. Release attachment & neediness in relationship, as you cultivate a reconnection to the complete-ness at your centre. Food as Medicine – Learn to build Agni ( digestive fire), tone the the digestive system, deeply & holistically nourish your whole being, physically, mentally & emotionally. Understanding the energetics of “earth” type foods from a macrobiotic perspective. Asana’s ( Yang & Yin ) to open the chest & hips, nourish the lungs & large intestine & support the body & the mind to authentically let go on all levels. Pranayama & manta to vitalize the lungs & tone the body’s elimination system. Food as Medicine – Learn to clear the skin & sinuses & support healthy elimination with “Metal” type foods. Understanding the energetics of food from a macrobiotic perspective. In Metal Yoga we learn the art of Letting Go. Embracing the law of Impermanence, we learn to adapt to change & embody authentic non-attachment, as we discover a direct path of connecting to the eternal & unchanging basis of reality. We release stuck grief, stories from the past held in our cells & open to the freedom, positivity & pure potential available to us in the present. Allowing us to let go of the old & make space for the new. “Focus your mind on ‘I am’, which is pure and simple being.